We all feel a calling to homeschool as part of our God-given vocation. 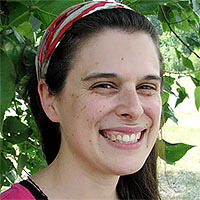 Jennifer Elia presents five easy, meaningful ways to invite God into your classroom. 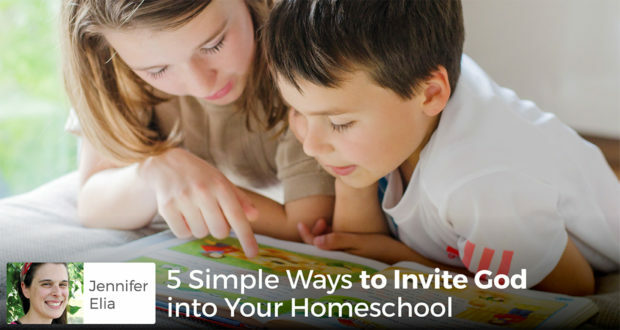 We all feel a deep calling to homeschool as part of our God-given vocation. However, have we ever stopped to invite God into our homeschool classroom? Here are five ideas for bringing your efforts to the feet of Jesus and letting the LORD walk you through your school day. Taking a few moments to pray each day as a school can help everyone stay directed toward our ultimate goal of Heaven. I have found that the days when we get overly distracted or bogged down by the volume of work, not allowing ourselves the time to take a break and pray, are usually the hardest ones to get through and the least productive. It may seem overwhelming to schedule prayer time into your day, but doing so will only alleviate your burden, not add to it. The Fatima Prayer, the Angelus, etc). These short moments put us into the presence of God and help direct the rest of our study session. We then wrap up our day by lighting a blessed candle and praying the St. Michael Prayer. Short, easy to follow prayers will draw the children into worship instead of intimidating them. Finding just a couple of two minute breaks for a special group prayer will bless your day immensely. We really enjoy our read-alouds. It is a great way to teach literature, history, and geography. Moreover, it is a wonderful way to celebrate our Catholic faith as a family. I especially enjoy sharing the old, traditional books that teach catechism and virtue through short stories. When we listen to the harrowing and heroic life of a saint or the sweet little story about Jesus as a child, we are not only enjoying the language presented, but also our hearts are pondering God. Allegorical Tales, such as The King of the Golden City. A homeschooling friend of mine calls her little school Grace Academy, because she says it is only by the grace of God that they are making it all work. She adds that this title is also useful if anyone asks why her children are out and about during regular public school hours. She just answers, “Oh, Grace Academy is on an early dismissal today”, and no one questions further. In addition to giving your little one room school house an identity, choosing a patron saint fosters a deeper appreciation for God’s special friends, the saints. Our school is the Academy of St Therese for the Glories of God. Just last year, we each chose a name based on a favorite saint and then prayed before “casting lots”, letting God choose the name for us. We have a beautiful hand painted icon of St. Therese in our school area, and St. Therese is a saint we discuss frequently. Create custom ID cards and t-shirts for the children and yourself. Add a prayer written by your chosen saint to your prayer time. Pray a novena to your saint to kick off the school year. Decorate notebooks and pencil cases with pictures or stickers of your saint. Add writings of your saint to the read aloud list. When the floor falls out from beneath you, it is easy to beg God for help. However, God is always with you, and He is always there to listen. He wants you to pray about your little worries and dilemmas, lay every decision at His Feet, and watch your life unfold. Not sure which spelling curriculum to use? Pray about it! Deciding if it is better for your daughter to take ballet lessons or join 4-H? Send up a prayer! Stuck on your school schedule and how to manage your time? Ask God for wisdom. Ask God first, not last. By inviting Him into the details, you are interweaving His Fingerprints into your entire school experience. I have to admit that I have been known to mutter a quick prayer when everyone is hungry, and I have no idea what to make for lunch. Give it a try! The Catholic homeschool group that we joined this year has a monthly family Mass followed by a picnic lunch and playtime in the park. Taking the time once a week, once a month, or even just once a year to invest your school time in worshipping God will return multifold dividends. Our children’s souls are the most precious gift for us to guide, shape, and protect. Praying at Mass, the ultimate prayer, with just our children or a church full of friends, strengthens everyone’s constitution and gives us grace for the journey. Consider a weekday Mass a field trip or an elective; either way, make Mass a part of your school culture. How have you invited God into your classroom?